More than a story of hatred and violence, this is also a story of loyalty and friendship as teenagers of the urban slums search for personal dignity and a place in the world. The story is told by a Greaser called Ponyboy. Greasers, Rockers, different place, different name; but wherever they are, they're outsiders, the rough, tough, long-haired boys from the 'other side' of town, with little hope of Mustangs, madras shirts and the good things of American life in the sixties. Their story is told by Ponyboy, a Greaser with good reason to fear the lucky boys in Mustangs, and a witness to the savage baiting that leads his best friend to manslaughter. More than a story of hatred and violence, also a story of loyalty and friendship as teenagers of the urban slums search for personal dignity and a place in the world. S E Hinton wrote THE OUTSIDERS, her first book, when she was 17 and it was a phenomenal success. Its publication enabled her to attend the University of Tulsa, Oklahoma and she graduated in 1970 with a major in education. 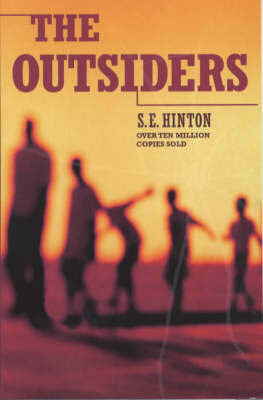 S E Hinton was the first recipient of the American Library Association Award for an outstanding contribution to Young Adult Literature. She lives in Oklahoma.